Snow buckwheat is conspicuous because it flowers in late summer when other plants in its rocky habitat are dormant. Sometimes it grows so abundantly that the landscape appears dusted with snow. Snow buckwheat grows in clumps up to sixteen inches tall and wide. The crown gives rise to numerous short woody stems. Leaves attached to the main stems are short (less than three inches long) and generally oblong. The undersides of the leaves are gray and very “woolly” while the tops are only slightly hairy. The flowering stems are also woolly. 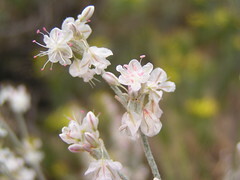 The flowers are white or light pink and turn brown at seed maturity in the fall. Mule deer make heavy use of snow buckwheat in the winter and early spring months. Small birds and mammals use the canopy for cover. A tea brewed from the roots and stems of snow buckwheat was used by Native Americans as a cold remedy. A decoction of roots and stems was used to wash infected cuts and sores.